alaTest has collected and analyzed 226 reviews of Philips 55POS9002 Series. The average rating for this product is 4.5/5, compared to an average rating of 4.3/5 for other products in the same category for all reviews. Opinions about the glare and price are on the whole positive. The design and image quality also get good views. We analyzed user and expert ratings, product age and more factors. 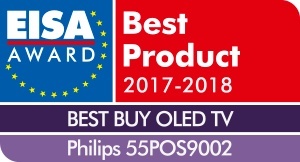 Compared to other products in the same category the Philips 55POS9002 Series is awarded an overall alaScore™ of 98/100 = Excellent quality. Philips 55POS9002 review: Philips' second OLED offers up irresistible subtlety, detail and naturalism. It's not the most dynamic OLED, however. For a substantial corner of the serious AV world, the 55POS9002’s focus on subtlety, detail and naturalism will prove hard to resist – especially when they clock it’s price. Adding Ambilight to OLED is brilliant, but this Philips has much more to offer. While the 55POS9002 isn’t the showiest OLED TV in town, it’s unexpectedly natural and refined pictures, plus affordable price, will win it many AV fans. The Philips 55POS9002 is a stunning TV. For this level of performance, the asking price is eminently reasonable, and with great motion handling, video processing and Ambilight/ Philips Hue integration, it definitely deserves a place on your wish list.